Apple today has released iTunes 9.2.1 for both Windows and Mac OS X. This is a minor release which mainly brings stability & performance improvements, along with bug fixes when taking backups and syncing all the iOS based devices. Full change log is as follows. This new update is not available yet on Apple Software Update utility. You can grab it directly via the link given below. Note for Jailbreakers and Unlockers: It is better NOT to update until I have tested it with my jailbroken / unlocked iPhone. 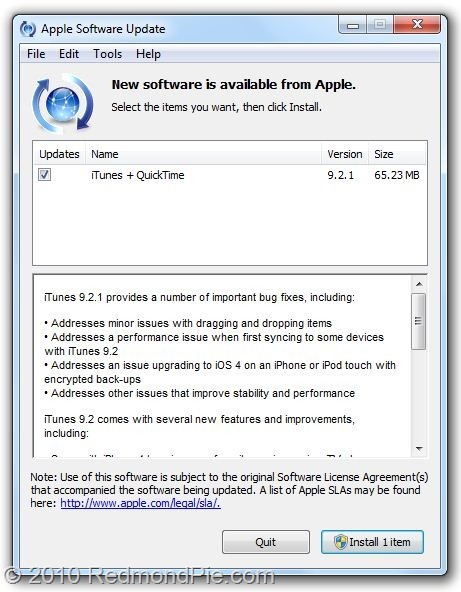 UPDATE 1: iTunes 9.2.1 update is now available on Apple Software Update. UPDATE 2: It has now been confirmed. iTunes 9.2.1 is safe for all jailbreakers and unlockers. According to @MuscleNerd ITunes Update 9.2.1 is fine for already Jalbroken Devices, also for Jailbreaks made with redsn0w/PwangeTool. Avoid using updating for devices which Jailbroken using the latest Spirit Jailbreak. That's great news, I have to check it out. Is anybody else having problems with itunes? since new update? the new itunes has dissabled my basestation remote..
is it safe to upgrade and jailbreak it? because i have an ipod touch 2g 4.0 mc model and there is currently no jailbreak for it but will it help? Yes, I’m not able to access my account. i hav upgraded to itunes 10 , will jailbreaking work for me on my ipod touch 2G ??? ?